Contemporary women writers in these two societies are still writing about similar issues as did earlier generations of women, such as exclusions from discourses of nation, a problematic relationship to place and belonging, relations with indigenous people and the way in which women's subjectivity has been constructed through national stereotypes and representations. 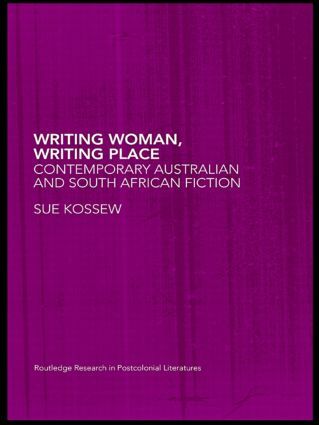 This book describes and analyses some contemporary responses to 'writing woman, writing place' through close readings of particular texts that explore these issues. Three main strands run through the readings offered in Writing Woman, Writing Place - the theme of violence and the violence of representational practice itself, the revisioning of history, and the writers' consciousness of their own paradoxical subject-position within the nation as both privileged and excluded. Texts by established writers from both Australia and South Africa are examined in this context, including international prize-winning novelists Kate Grenville and Thea Astley from Australia and Nadine Gordimer from South Africa, as well as those by newly-emerging and younger writers. This book will be of essential interest to students and academics within the fields of Postcolonial Literature and Women's Writing. "The strength of Kossew’s book lies especially in her detailed, rich, and thoughtful readings of the selected works. Writing Woman, Writing Place takes a critically rigorous approach and offers meticulous attention to the possibilities that emerge at the crossover of colonial and postcolonial identity formation, especially as this relates to place, space, time, and, crucially, gender." Sue Kossew was born in South Africa and spent her childhood in Zambia. She lived and taught in England and has been in Australia since 1987. She is a senior lecturer in the School of English at the University of New South Wales. Her previous publications have been in the field of South African and Australian literature, notably on J.M. Coetzee, André Brink and Nadine Gordimer. Edited in collaboration with the Centre for Colonial and Postcolonial Studies, University of Kent at Canterbury, Routledge Research in Postcolonial Literatures presents a wide range of research into postcolonial literatures by specialists in the field. Volumes concentrate on writers and writing originating in previously (or presently) colonized areas, and include material from non-anglophone as well as anglophone colonies and literatures.